We seem to have just reserved ourselves a new house! As you all know we have been debating for several years now what our next home will be and if it will be bricks and mortar or a floating home. One thing we did know is that our current ex council semi in Sheffield had to go. It was no longer suiting us. It had to go one way or another. So we have part exchanged it for a three bed detached house with a garage on Gateford Park in Worksop. We have spent a good few hours today deciding between two plots which were the same house type on very similar plots but with different specifications. Both almost complete so being offered with some very attractive offers as the developers want them off their books before their year end next month. We did finally pick a plot and reserved it. Now is a mad dash to get paperwork sorted as they want a quick completion. It looks like Naughty-Cal will be having another few months ashore while we get sorted and we will have to rearrange our holiday in Belgium which is booked for Easter. But that's not a problem. Fingers crossed for a quick move. Congratulations, hope all goes well for you. 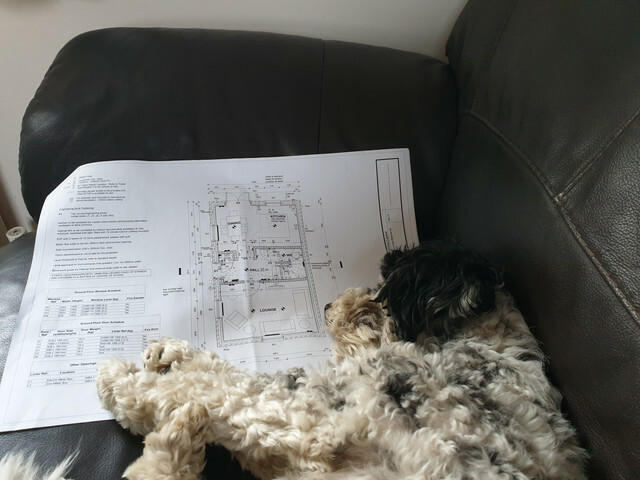 Sydney is just checking out the plans. The developer is one we work with on a regular basis at work. Unfortunately not a site we have worked on but we did manage to get some extra information from the technical staff. Moving away from Yorkshire into Robin Hood country. That is partly why we have gone down the part exchange route. We could without a doubt get more with a private sale but then we have estate agents fees, messing about with viewings, a chain to contend with and solicitors sales fees which are picked up by the developers with a part exchange. Going to take some getting used too parking on a flat drive! I found it was much easier checking the car oil level when we moved to such a drive. Disadvantage when I wanted to bump start the bike though. Takes all the fun out of winter driving. But Worksop........ I always thought the Chesterfield canal would be absolutely great if only Worksop could be moved. Tis the posh bit of Worksop. Hey! It's not that bad, my boat's home port before it came down South was Worksop and it is named 'Albion Mills' after Albion Mill in the town. .....good luck with the new house. It is going to be a manic week of dealing with paperwork, solicitors, surveyors and estate agents. Yesterday we were busy tarting our house up in the hope of getting a favourable trade in value. We went through the figures with the sales team on Saturday and told them the minimum figure we could accept which we then compared to what other houses had sold for in the area. They agreed that we would get at least that minimum figure there and then but their surveyor needs to come around and confirm the figures. For now we are working on that minimum figure but they do hope to improve on that when they have spoken to local estate agents who will market the house for them. Today we will be sorting through the finances with the financial advisor and getting the mortgage agreements in place and we need to get the solicitor geared up for a quick start and exchange of contracts. I've just had a look at their web site and the houses (whoops sorry, "homes" - no one builds "houses" any more) look pleasing - some have a rather retro touch which reminds me of Metroland apart from the built-in garages. You must be very excited. But the web site says that all the, er, homes are 4 or 5 bedrooms: perhaps you were lucky to get a 3-bedroom one before they were all sold. 3, 4 and 5 beds. They have taken the one we have reserved (Plot 227) off the website now but it is the same as Plot 237. I see now - but when I put "Gateford Park" into the search engine, it took me to "Jones Homes" and the houses depicted looked different from yours. Perhaps more than one builder is developing the estate. Your house, with its central front door ("double-fronted", I think the expression is), looks like the ones they build in the Fens (such as ours, visible in my avatar)(. They always look as if they're build solidly so that they don't get blown down. Whatever, from ex-council semi to detached property, you're obviously moving up in class. I hope you'll still speak to us. There are a couple of developments on going at Gateford Park at the moment. The Jones Homes one is next door the the BDW site. Looking ahead the plan is for about another 750 homes in the area over the next 10-15 years. The plot we have chosen is nicely tucked away on a small no through road so we won't be affected by the later development phases. We will have four to six weeks before the shell of the property at the end of the garden is finished. But hopefully that will be up and substantially finished before we move in and then there are only a handful of other properties on the part of the estate we are on for them to start. So we shouldn't be living in a building site for too long. We like the double fronted look and both the living room at one side of the house and the kitchen diner at the other are both dual aspect with windows in two elevations. The only slight oddity is that the side of the house where the driveway is has no openings. So to get from the driveway to the house you have to either go around the house to the front door or go through the garden and in via the patio doors in the kitchen. Neither is really a problem but it did seem a little odd at first. It does sound strange yes, but after the first few weeks I bet you won't even notice. I wonder nif developers, in the same way that they say "homes" instead of "houses" and "apartments" rather than "flats", now use "no through road" instead of "cul-de-sac". Whatever you call it, it sounds like a good location. Our last house, in Derbyshire, was at the end of one, so there was no through traffic, though there was a ginnel/ jennel/ twitchel between our house and the next one so there was a bit of pedestrian traffic. We only sold it because we'd found a house with its own mooring, otherwise we would probably still be there. SWMBO asks - is there a garden for Sydney? Looks good and amazing value - you would pay an extra £175 to £200K in this area (South Bucks). Hope all goes well with the trade-in, all I hear as a justification for low prices is 'it's the Brexit effect'. Cobblers! I say. Yes there is a lovely little garden for him. Nice and flat with a nice high wall around most of it so very private as well. Only a tiny bit if fence behind the garage between our plot and next doors. The plot is about as detached as you can get on a new build estate. The nearest house is 6m away. We have already discussed this with sales and they have already hinted they would make up the extra as a deposit contribution if they don't offer what we need. The nearest house is 6m away. Sounds like the summit pound of the Oxford Canal - unless, of course, you mean "metres" and not "miles". Part Exchange valuation is booked in for Wednesday morning.